Today we have heard about genes by Lola, we have heard about memes by Arie, I will now introduce a third replicator, ‘machemes’. Machemes came in existence after memes had build themselves new vehicles. Where they first only had humans in which they could exist, they have build themselves books, websites, cd’s, radio-waves, etc. Some of these vehicles had the possibility not only to cary, but also to copy. The information that is stored in these vehicles (other than humans) and can be copied will I call Machemes. Previously, information in books was called memes. All ideas, wether they exist in the human brain or on a paper, were considered memes. I now say that only the ideas that exist in your brain are memes. The information in books, on cds, on the internet, will I call machemes. Why do I separate machemes from memes? I think they have one important difference: Machemes do not disappear if you forget them, they have their own environment in which they can exist and are not dependent on the human brain like memes. For example: when everybody in the world has forgotten how the ABC-formula works, it is still in a book but in nobodies brain, it is not a meme anymore. It now is a macheme. This macheme can of course become a meme again if someone read this formula and this formula stays in this someones brain, but if it doesn’t, it stays a macheme. 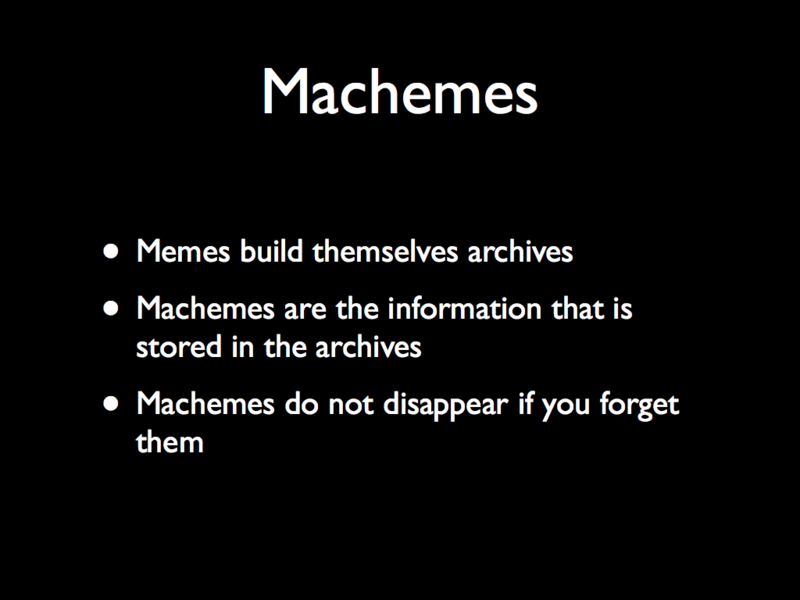 Memes versus machemes, the most important difference is that machemes do not disappear if everyone has forgotten about them. An other difference is the speed of replication. If these machemes can, like memes, also replicate themselves, they will be much faster. Genes can only be transmitted from parent to child. This is by nature a very slow process. Memes can be transmitted between any two individuals and already is much faster. Machemes can be transmitted via technology all over the world which is obviously the fastest of the three. The quality of the copy of the replicator is also different: A gene can make an almost perfect copy. For a meme this is much more difficult: every individual’s version of an idea or belief will be in some respect different from the others. The quality of the copy of machemes is higher: by copying something digital you will not lose information. The information is just stored elsewhere.